TWO HISTORIC CINCINNATI Celebrating 150 Years TOGETHER. 2019 is set to be a great year for us. 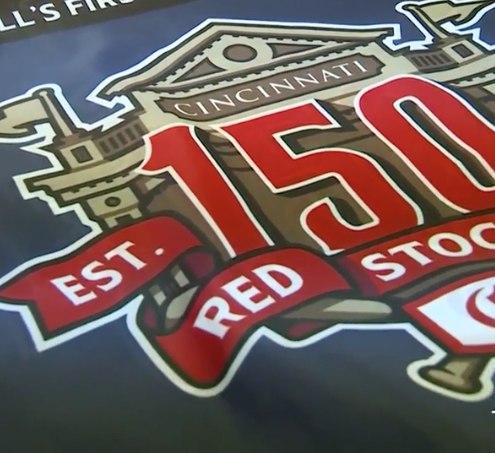 National Flag along with the Cincinnati Reds are celebrating 150 years. NFC is making a new set of 150th logo decorative fans for the entrance to Great American Ballpark, 300 150th logo banners, and thousands of feet of pennant strings. You will find the pennant strings and banners at local bars and restaurants in the greater Cincinnati area. The Reds generously let us put our 150th logo next to theirs on the pennant strings.